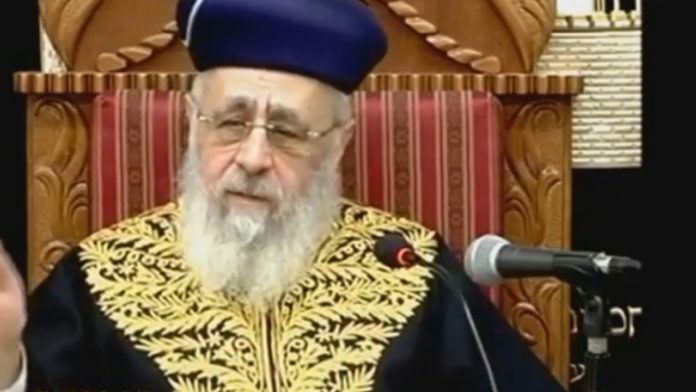 Rishon L’Tzion HaGaon HaRav Yitzchak Yosef during his weekly shiur in Beit Knesset Yazdim in Jerusalem, said women are forbidden to bathe on a separate beach where there is a male lifeguard, unless they wear a robe. It should be noted that most of the beaches in Israel, even those considered separate beaches, have a male lifeguard. Why do we need a gadol to tell us about this? Every erlicha yidishe daughter should know this on her own. Another place is when there are male musicians at a chasina and the girls dance in front of the musician is also not right. Why is a male lifeguard (doing his job) different than a male doctor (doing his job) ? adocs – Poskim note that a doctor is _actively_ involved in his job. A lifeguard is _passive_, and, as such, is more subject to hirhurim. why does the fool ADOCS think he knows better than this sar hatorah? A lifeguard who is “passive” and “uninvolved” with his work is not doing his job and is not a lifeguard. A doctor doing interviews or a male nurse checking on patients is also passive/active depending on what they are doing at the moment. Frumroshyeshiva, I happen to think ADOCS had a valid question, same question applies with male dentists, teachers, etc. Or what about a non-Jewish male lifeguard? ADOCS never said anywhere that he knows better, the only one that said that phrase is you. Are you personally familiar with every psak from every Rav on this very issue? My form of Judaism allows us to respectfully ask questions from shiurim, Rabbonim, and psak halacha. I’m sorry you view it as a passive mute button. TGISHabbos is anothe one of those kofrim questioning rabbanim if someone knows more torah than me and is a bigger yorei shamayim than me i listen. im sorry to hea you and ADOCS werent raised normally or religious and hink you coul ask questiions on this tzaddik. Frumroshyeshiva, where in my statement did I question the Rabbonim? Where in my statement did I say I am bigger in yorei shemayim? What level are you on to be the judge on who is a kofer or a tzadik? Frumroshyeshiva, who told you that it is muttar to call someone a fool in the comments section of a news story? Can someone explain this to me? I’ve been on women’s beaches before and everyone is still dressed b’tzniut. Just because it’s for women only doesn’t mean they’re throwing off tichels and putting on bikinis. So is the Rav saying a man can’t watch perfectly tzanua girls/women splashing around in the water? Or is he basically reminding people to keep tzniut even if it’s women only? I wondered about that when I was in Ashdod beach last summer. The male lifeguard had to stand in the water because these super-frum girls in their robes & stockings refused to obey his instructions not to use their tires to go beyond a certain point. My little granddaughters & I just watched from the sand & they wanted to know why the big girls wouldn’t listen & why the man with no shirt was in the water. Chilul Hashem for the lifeguard to see this & very uncomfortable for female bathers. Why can’t the city hire female lifeguards? Let’s all remember that tonight is Rosh Chodesh Av. Remember why we lost the Second Bais HaMikdash. Assuming Frumroshyeshiva is being serious and not sarcastic, one is amazed at the idea that questioning a news article is somehow forbidden, as if the news article is somehow revelation, like a Chumash. In other words, forbidding the questioning of a news article is an act of extreme apikorsos. Frumroshyeshiva, And lastly how do you know I wasn’t raised normally or religious? That’s a ridiculous statement! I can’t speak for ADOCS because I don’t know him (it appears that you do know him). Do you want me to list off the yeshivos and shuls I attended since I was school age? Maybe I can show you the tzitzis I wore in the 1980’s when I was 5 years old? He said, “Unless they wear a robe. What’s all the trouble about…since when do frum women not dress b’Tzniut at the beach? He’s just reminding them, and their fathers and spouses. How sad that these days the essence of Yiddishkeit seems to have distilled itself down to endless discussions, in a forum most “gedolim” say shomer Torah u’mitzvos Yid should not go near, and I mean the Internet not YWN specifically, about “hirhurim”. Of course there will be attractive looking lady bathers on the beach and some of them will be wearing outfits not all the Rabbonim would approve of but it really is insulting to the lifeguards to suggest that instead of looking at the bathers constantly to see which of them might get herself into a dangerous situation, which is after all the lifeguard’s job, the lifeguard will spend the whole day gazing lustfully. If he wanted to do that he should instead walk down 13th Avenue in Boro Park where many of the ladies dress in a highly provocative way, but they are all very very tzniusdik of course. tirtza, I don’t think I fully understand you. (With the assumption it’s a separate-gender beach) Frum women would likely NOT dress b’tzniut at the beach, as it’s a place of swimming and laying in the sun. “Summertime, vacationtime…maybe people get a little more free…”- Absolutely, I agree. Within the confines of a separated beach/pool area, no reason not to be more free and enjoy. I’ve been to the beaches, they have workers who AREN’T life guards who are male. Frumroshyeshiva, I’m sorry I couldn’t get back to you sooner, after a full day of work I attend a daf yomi shiur followed by mincha and maariv at the yeshiva. After maariv I approached the Rosh yeshiva regarding a question from his email about ashkanazim and meat during the 9 days (as for my wife whom is sefardi, yalkut yosef has various different rulings) And because I don’t use my phone in shul during davening, I wasn’t able to respond to your this morning during shacharis either. Since you don’t believe in questions or sheila’s to Rabbonim it sounds like you have much more time than me. Because I attend minyan and shiurim daily, please forgive me for not responding to you in a quicker fashion. If you guys think a person isn’t allowed to ask questions in Torah, I don’t know what planet y’all are from. It doesn’t matter if Moshe Rabbeinu says it. Do you have to listen, yes! But that doesn’t mean you aren’t allowed to ask why it is. There is no way you can possibly understand the Torah at all or any Halacha whatsoever if you do not ask questions about what and why. Frumroshyeshiva may I ask what’s inciting you to personally attack people you don’t know? No frum Rosh Yeshiva would behave like this. shimen, Come one…… You know as well as I do that you are saying an absurd statement. Neither of us know one’s yiras shemayim from “blogging” or commenting on YWN. It’s possible that I have a deeper love for shabbos and more intense Shmonah Esrei than you, or it’s possible that you do, or any of the other 20 commentators here. By Kol Nidrei I am thinking zero about my past year’s involvement on the commenting threads on YWN, maybe you are different. Wise up! 5ish, Agree with you 100%. I’m not really sure which communities or upbrining several people come from where they believe that if you ask a Rav a question then you lack yiras shemayim and are a fool. This concept is all new to me. I would actually think someone like shimen or Frumroshyeshiva are the fools to sit passive at shiurim. When I was in yeshiva in Far Rockaway, I recall that the Rosh Yeshiva’s shiur was known to be fast paced and loud because his style was to be bouncing questions back and forth from bochurim, kollel yungelite with the Rosh Yeshiva. I once asked about it and was told that when it comes to learning, “fighting” (in a kavidik way) is a productive way to learn- just as Beis Hillel and Beis Shamai. On Pesach I will surely know who the “sons who don’t know how to ask” are! One concern would be to assure that there are sufficient numbers of qualified women lifeguards for those beaches which have gender-separate bathing. If not, consider whether its worth the pikuach nefesh that might result from swimming at a beach with no lifeguard or women who are not properly trained.